Williams finished with nine points (4-9 FG, 0-1 3Pt, 1-2 FT), five rebounds, four assist and two steals during the Sky's 97-92 loss versus Indiana on Sunday. It was a pretty modest performance by the rookie in the season finale loss Sunday, as she totaled nine points on 44.4 percent shooting while hauling in five rebounds. 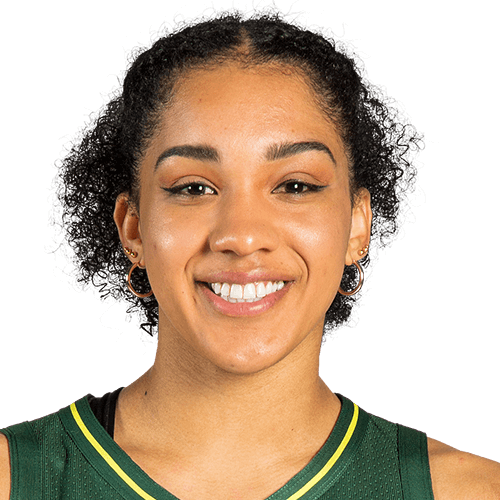 The former UConn standout finished her rookie campaign averaging 7.3 points, 4.3 rebounds and 1.6 assists in 34 games played. Williams contributed six points (3-4 FG), three rebounds, three steals and two rebounds in the 101-87 road win over the Mercury on Wednesday. Williams wasn't much of a factor offensively, recording just six points while shooting 75.0 percent from the field but was a factor defensively by adding a team-leading three steals in the win. The rookie is currently leading the Sky in steals with 1.7 a contest while also contributing 7.2 points and 4.2 rebounds across 26 games played this year. Williams contributed two points (1-4 FG), four rebounds, three assists and one steal in the 101-83 home loss versus the Storm on Wednesday. Making her 19th start and playing 16 minutes, Williams wasn't a factor offensively, scoring just two points across four field-goal attempts but did add four rebounds and three dimes during the loss Wednesday. The rookie is currently averaging 7.4 points, 4.2 rebounds and 1.7 steals across 22 outings this season. Williams added four points (1-7 FG, 0-2 3Pt, 2-2 FT), four rebounds, four steals and one assist during Tuesday's 108-85 loss at Dallas. Williams had a rough shooting performance in the loss Tuesday, as she only converted one field-goal across seven attempts while missing both of her three-point tries. The rookie has so far started every game this season for the Sky and she is averaging 7.2 points, 4.7 rebounds and 1.6 assists across 17 outings. Williams finished with four points (2-7 FG), six rebounds and two steals during Saturday's 82-64 win over the Fever. Williams started at the forward position Saturday and saw 28 minutes of action but was only able to produce a mere four points on 28.6 percent shooting. It's unknown if the rookie will be the primary starter at forward this year but if she can string together a few decent scoring performances in the next few games, it's more than likely. Williams is listed as a starter for Saturday's season opener against Indiana. Williams -- the fourth overall pick in April's draft -- will immediately contribute for the Sky after the team managed just a 12-22 record last season. She played power forward for UConn last season and had no problem cleaning up on the glass, averaging 10.6 points, 6.8 rebounds, 3.2 assists and 2.0 steals. She should work down low for the Sky, who will deploy two rookies (Diamond DeShields) in the starting five. Gabby Williams (born September 9, 1996) is a forward for the Chicago Sky. She played college basketball at Connecticut.